The CSV Generator Tool helps you to generate a CSV file that contains a customized array of user specified attributes and the corresponding Active Directory values, all ready for any bulk Active Directory management. This free tool takes a simple CSV file with basic attributes like sAMAccountName, and generates a full -fledged CSV file containing a comprehensive attribute list. This would save considerable time and efforts of admins and other staff associated with Active Directory management. Why should you consider this CSV Generator Tool? One main advantage of using this tool is that you can create a complex CSV file in a fraction of time by just supplying a simple and basic CSV as input. How to use CSV Generator? The following steps will guide you through to generate a CSV file. 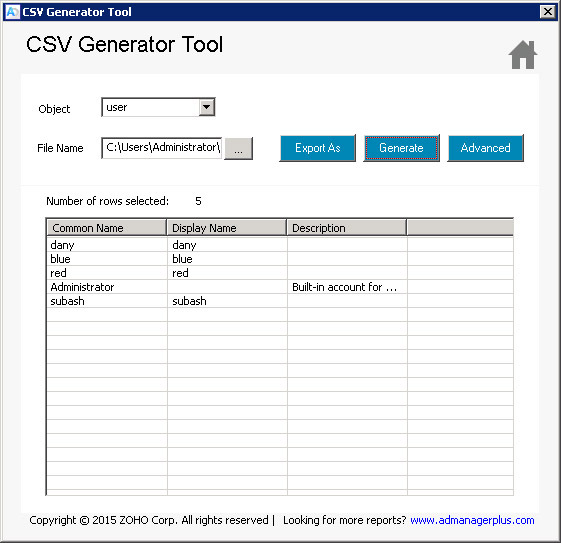 Click the "CSV Generator Tool" from the Launcher to start the tool. Select the AD object type from the list. Browse and select the import CSV file in the File Name field. Click on GENERATE to get CSV file containing Canonical Name, Display Name and Description attributes. Click on EXPORT to save the CSV file in a different location. Follow steps 1 – 3 as mentioned above. Click on the ADVANCED button. This opens the Advanced Attributes dialog. Select the attributes from the given list. The corresponding fields will get displayed on the left pane. Select from the list on the left pane and Click on ADD to include the attributes in the generation list, shown in the right. You can use the DELETE option to remove field names from the generation list. Click on the GENERATE button. This will display the object details with all specified attributes.